Service for Gerald Paul “Jerry” Jetsel, 77, of Cleburne will be conducted at 11:00 A.M., Monday, April 11, 2016 in the Church of Jesus Christ of Latter Day Saints in Cleburne. Mr. Adam Bond will officiate. Burial will be in Cleburne Memorial Cemetery. Pallbearers will be Jody Coleman, Mikel Smith, Melvin Burt, Wade Chaney, Cecil Bonham, and Robert McMinn. Visitation will be from 10-11:00 A.M., Monday, at the church, prior to the service. Gerald Paul “Jerry” Jetsel died April 4, 2016 from pancreatic cancer in his Cleburne, Texas home. He had lived in Cleburne for 20 years. He was born Dec. 7, 1938 in Beaumont, Jefferson County, Texas to Ernest Paul Jetsel and Mae Dell Lopp Jetsel. He graduated from high school there, where he excelled in academics and sports. After graduation in 1957, he was offered a major league baseball contract with the Pittsburg Pirates, had already enrolled in Lamar University Beaumont, and his father had gotten him a job at Texas Company (Texaco) in Port Arthur. Instead he joined the Air Force in 1957 and served as Airman 1st Class until 1961. He was in Intelligence and a cryptographer while stationed at Wheelus AFB, Tripoli Libya from May 1958-December 1959. He also manned a machine gun with twelve others in sandbag bunkers while guarding their Mediterranean Sea post against enemy sea invasion. Jerry was a member of the Church of Jesus Christ of Latter-Day Saints, where he served in many leadership positions including Bishop, High Councilman, and served in many other callings until his health failed. He was an avid genealogy/history buff, researching his ancestry and assisted many others with their family research. 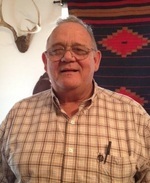 He became a member of the Johnson County Historical Commission in 2004, serving several years. He was a charter member of the General Pat Cleburne Camp #436, Sons of Confederate Camp, Descendants of Confederate Veterans and currently Terry’s Texas Rangers Camp 1937, where he was Camp Historian, and Past Commander. He served voluntarily behind the scenes and when possible for The Johnson County Child Advocacy Center, and honored all those working to protect children. He owned his own business in Dallas, became Assistant Manager for Brass Craft Manufacturing and held other management /supervisory and Quality Control positions for other concerns. Before retirement he worked for Fowler Equipment in Arlington. Survivors include his wife, Pam Jetsel; sons, Kreg Jetsel and D. Kyle Jetsel of Boise , Idaho, Kurtis Jetsel of Arlington, Keath Jetsel of Dallas and Krystal Wilkinson of Phoenix, AZ; step-sons, Cody Allen of Orem , UT, Jared Weinman of New Berry Park, CA, Joseph Weinman of Houston, TX and step-daughter, Robyn Betts of Riverton, UT; 27 grandchildren; and six great-grandchildren. Jerry was preceded in death by his his parents.